Don Diego de la Vega: [to Elena as he lays dying] The world is a very strange place... to have found you at last - only to lose you again. Elena: You will never lose me, Father. Q: What kind of dance were Elena and Alejandro doing at the banquet? 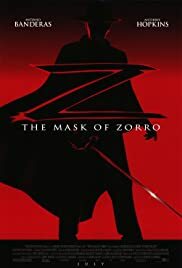 Q: Is 'The Mask of Zorro' based on a book? Zorro is one of my favorite heroes. He looks quite cool and not stupid, weird or childish like Batman, Superman, Spider-Man and all of their villains (except The Joker) and he has no superpowers like them, although sometimes it seems that gravity does not really apply to him. His weapon of choice guarantees some spectacular sword fighting scenes as well. With this hero all you need is a nice story and 'The Mask of Zorro' has a nice story. I will be short about it. Don Diego de la Vega (Anthony Hopkins) was Zorro but is too old now. He needs another one and Alejandro Murrieta (Antonia Banderas) is the chosen one. Their enemy is Don Rafael (Stuart Wilson). His daughter Elena (Catherine Zeta-Jones) is actually Diego's daughter. His wife was murdered and his daughter was taken by Rafael a long time ago. Rafael also made sure the brother of Alejandro was killed by his helper Capt. Love (Matt Letscher). And now he has an evil plan that will kill a lot of people. Time for the new Zorro. It sounds a little simple and may be it is, but for a movie like this it is a perfect story. Anthony Hopkins who is never bad does not disappoint us here, Banderas has the right charm to play Zorro, Zeta-Jones is absolutely stunning and Wilson and Letscher are very good as the villains. With some nice action sequences and a pretty good soundtrack this is a very entertaining movie.